Happy happy Friday Bloggie friends! What a relief that it’s already Friday! I am so ready for the weekend! For today I’m not only posting a yummy new recipe of me but I also link-up with Davida for her great St. Patrick’s Day Green Food link-up! I hope you don’t mind me linking-up though my picture isn’t really green. The photo is not brand new and therefore I had to go with what I had already made. 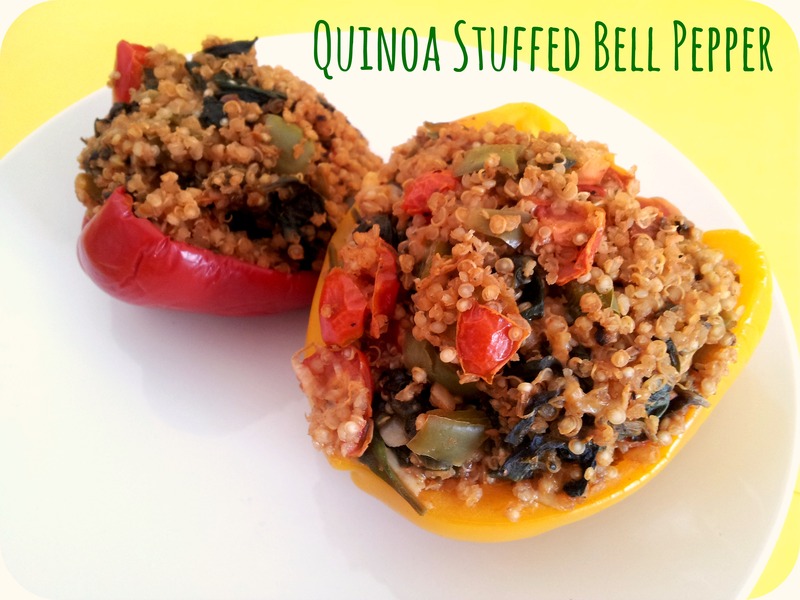 But obviously my quinoa stuffed bell pepper recipe can be made totally of green bell pepper of course and additionally I’m giving you a recipe recap of all my mainly green recipes 🙂 Enjoy all the green food! It’s so yummy and healthy and perfect for food prep. You can just make a batch of those on the weekend and take them to work as a side or main dish. It should be good in the fridge for minimum 3 days. It’s again another short Friday for me! I can’t wait to get out of the office! The weather is just too nice! Today Stefan and I celebrate our 2-year engagement anniversary! Not really a day you usually celebrate but we both love a good excuse to fire up the grill and enjoy a giant steak with potatoes and asparagus. Have a great start to the weekend lovely’s! And don’t forget to head over to lovely Davida and check out all the delicious green food she cooked up. I also posted a quinoa stuffed recipe today! I love your addition of the spinach! Juli- I am going to make this but sub out the quinoa for ground beef….it looks amazing! I made one the other day but ground beef, some spices and tonnes of CUMIN. It was epic. Ground beef is a wonderful idea! You should up the spices as beef always swallows so much taste! Let me know how they turned out!